Jim Elliott in Ardell's California office sends in the news that his central agency for sale, Cheoy Lee's 28.04m First Home, has had a price reduction. Built in 1988, she has had over $3 million spent on system, interior and navigational upgrades in 2006/2007, and is now asking $2.495 million - down from $2.85 million. 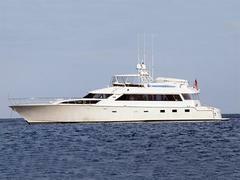 _First Home _accommodates eight guests in a master, VIP and two twins and cruises at 17 knots.